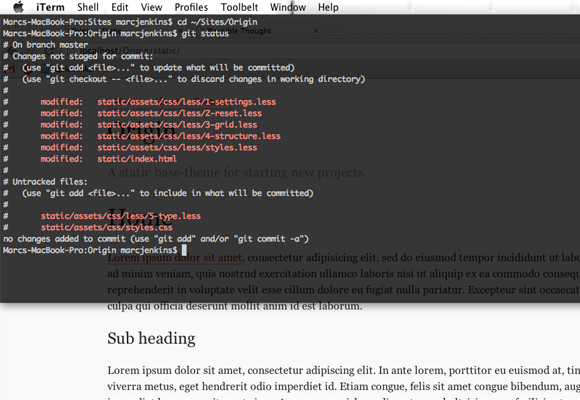 I’m a recent convert to using the Terminal. I use it all day, every day. From pushing changes in Git, to creating files and directories, to downloading sites using wget, Terminal has worked its way into my workflow. I recently found a great tool called iTerm2. It allows you to assign a hotkey which then drops a Terminal window down, as shown below. It allows me to quickly commit and push changes and get straight back to work. 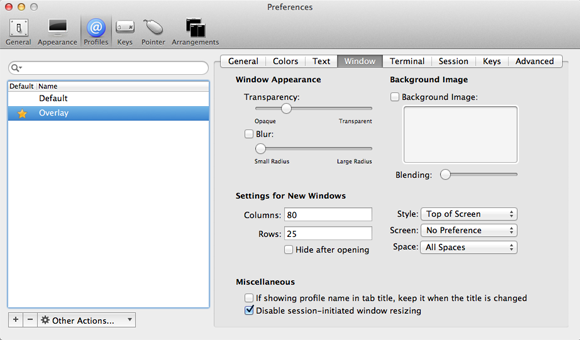 Open Preferences and click on the ‘Profiles’ tab. Create a new profile, give it a name and set it as default. Slide the transparency slider to the right. Style should be set to ‘Top of Screen’. Finally you just need to set a hotkey – click on the ‘Keys’ tab, select the ‘Show/hide hotkey’ tickbox and enter a hotkey. Restart iTerm for the changes to take effect and you’re done.